I didn't get quite enough dye into all the folds, so there is a bit more white than I would like, but you can see that the pattern actually came out quite a bit like the paper one! One disadvantage of all-cotton sheet sets is that they wrinkle like crazy. Since I'm still practicing my "done is better than perfect" policy, I haven't bothered to iron them. But these pictures get the idea across, and my kids don't care--they've already started arguing over who should get these sheets! I recently did a corporate team-building activity at a local company's "Oktoberfest" event for their employees. Since there were lots of participants (they had ordered 150 shirts, and had a few left over), I got lots of help from a lot of great volunteers who are also really into tie-dye (thanks, everyone!). The activity seemed to be quite a hit! I took home the leftover shirts and dyed them for myself and a few employees who didn't make it to the event. You can see pictures of those shirts here on my Picasa album site. 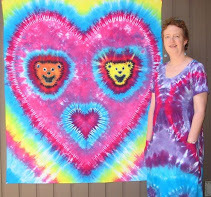 I've been thinking about doing tie-dye demonstration videos to put onto YouTube, and I got one of the volunteers to video me while I was demonstrating how to do a couple of the fold patterns. The videos are completely rough and unedited, and there is polka music in the background! 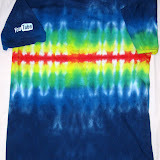 Who would have thought that polka makes a great soundtrack for tie-dye? Anyhow, I'm not sure when or if I'll get around to doing them the "right" way, so I figured I'll put them on YouTube for now just as they are. After all, I describe myself as a "recovering perfectionist"--where "done" is better than "perfect". I'd say these are worth lots of perfectionism recovery points! In this video, I show how to fold an X pattern. Here I demonstrate folding a diagonal stripe pattern. Amazingly, Lacey knows which shirts are the ones for me, and she just stands on those. Either that, or she just knows that she looks best with a backdrop of blues and greens! Playtime with a cardboard tube. I've been experimenting with black and gray dyes recently. I used Better Black, New Black, Charcoal Gray, and Black Cherry (okay, that's more of a dark red), all Procion dyes from Dharma. I made them up in various concentrations, starting with "1" strength as the formula recommended on the Dharma site: 2 to 8 teaspoons (10-40 ml) and 1 tablespoon (15ml) urea per 1 cup of water for the Procion dyes. The blacks needed 8 teaspoons each, while the charcoal gray only needed 2 teaspoons. The black cherry took 4 teaspoons of dye per cup. I then mixed up "1/4", "1/8", and "1/16" dilutions of those dyes by adding more urea-water to the appropriate amounts of the "1" solutions. I also mixed up one teaspoon of sodium alginate thickener in one cup of water (stirring and letting it stand overnight). When completely dissolved, it was about the consistency of molasses or honey. I put about 4 teaspoons of thickener mixture into each cup of dye at the various strengths. That proportion is a little rougher, since I wasn't extremely exact on those measurements of the thickener! I marked up an old white shirt with permanent marker, soaked it in soda ash, then dripped on small amounts of each solution. 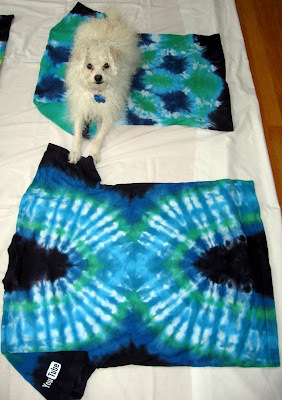 Here is the shirt still wet, just after dyeing. You can see the blue edges on some of the spots where the dyes separate. It's even worse without the thickener. I tried again in the lower right corner after doubling the amount of thickener in the solutions (for "1/4" strength dyes). Here is the same shirt after sitting overnight, then washing and drying. It looks like a chromatography experiment with all the bleeding and color separation! If I need to do anything sharply black, I'll have to add a lot more thickener in the future. However, I really love the bleed effects and I like to use them intentionally to get all sorts of subtle shadings. This isn't my usual palette of blues, greens, and purples, but once I had all those different solutions mixed up, I had to use them, right? Here is a "Moonlight Sonata" crop top done with a repurposed United Colors of Benetton shirt. I love the word "repurposed". It's like a "pre-owned" car. It sounds so much better than "used" or "thrift shop"! It even sounds better than "recycled", even if it's a little slower rolling off the tongue. I stitched the moon with dental floss and covered it with the repurposed thumbtip of a used rubber glove secured by the floss ends. No, the dental floss wasn't "used", though I guess using it for something other than teeth counts as "repurposed"! I only did the moon on the front layer of the shirt. Long "Moonlight Sonata" shirts: I made two of these, different sizes, opposite designs. You see the back of the left one and the front of the right (the front has ties at the neck). These shirt blanks are new from Dharma: Light Jersey Extended Sleeve shirts. They are REALLY thin shirts, but I rather like the results. I'll have to get some more of these. They'll be good for high-resolution geometric designs. I call these my "Three Sisters" shirts. I love the subtle shades. I used all the various blacks, grays, and the "black cherry" color. The shirts are cotton-spandex shirts from Justice, a chain store catering to pre-teens. I happened to pass by it one day and plain (white) shirts were on sale. I nearly cleaned out their supply! The "Two Sisters" (my kids), immediately ran off with them. Here's a cotton bandana. It was folded, tied, soaked in soda ash and then let dry completely before dyeing. I'm pretty happy with the results of my experiment. I might just have to use blacks more often!